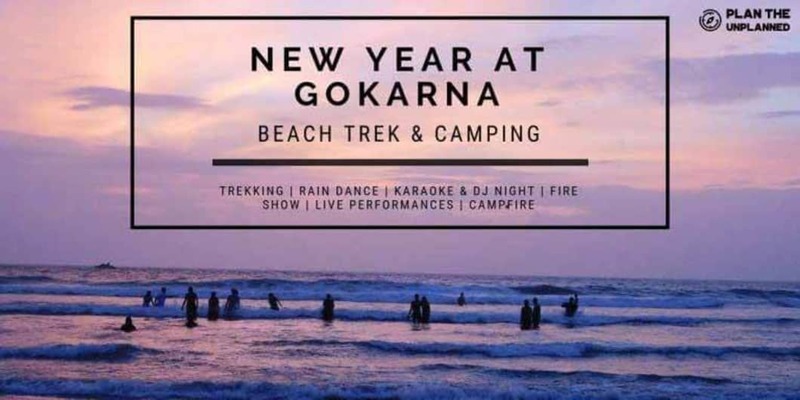 Let’s bid adieu to 2018 with a bang and what better place to do just that than the serene beaches of Gokarna this new years eve. Let out the hippie in you as we spend a few nights under the open skies with just the music of the waves and the sand in your feet for company. You can’t ask for a better setting to reflect on the best of what 2018 offered and simply leave out all the rest while dancing away your worries and rejuvenating your souls for what 2019 has in store!. Join us with your best of buddies or join us solo and make some new ones of your own. It’s new years eve and anythings possible with Plan The Unplanned! Time to hit the Dance floor & groove to the DJ’s beats! Accommodation for two nights in 2, 3 or 4 Sharing basis in Tents. We begin our journey from Bangalore in the late evening after picking up trek participants from various pick-up locations. We will be covering a distance of 500 kms to reach Gokarna overnight and the aim is to reach on time hence, all travellers are expected to have a light dinner before boarding. As we hit the road, the trek leads will give you a brief summary about the trek and then get you acquainted with your fellow travellers through the signature PlanTheUnplanned intro session. By the time dawn arrives, you’ll feel right at home with all of your fellow travellers! If you look outside your window, you will spot salt farms in the near distance. This means that we are now just minutes away from our destination. Carry your belongings into the campsite, freshen up, have a bite to eat and get ready to start the trek to the base point. We now head back to Gokarna beach where a thrilling sunset rain dance awaits to energise our tired bodies. Freshen yourselves up after a long day of trekking before gathering around a campfire to warm yourself up, sing to the tunes of your favourite songs on karaoke night and fall asleep under the starry skies in your cosy tents. Wake up early and catch the sunrise or sleep in and take it slow. Today we go by your rules. Explore the chilled out vibes of Gokarna town and do a bit of souvenir shopping or simply laze around the campsite and get high on vitamin sea! No trip with Plan The Unplanned is complete without a bit of unplanned adventure! However do make sure you return to the campsite by 5 PM as you don’t want to miss out on the new years eve celebrations we’ve got planned for you. We’ll be starting off the evening with some beautiful live performances by local artists followed by some exciting beach games. Don’t forget to catch the last sunset of 2018 in between all the fun! Have your last meal for 2018 in style with a gala buffet and candle light dinner before we sit back and enjoy an exciting fire show and fly away your sky lanterns in traditional new years eve fashion. Wish yourselves a happy new year and welcome 2019 with a bang! Today we have an early start and bid adieu to the beautiful beaches of Gokarna but not to the hippie vibe! We expect to be back in Bangalore by 7 PM. So what are you waiting for? Sign up to have your mind-blown by PlanTheUnplanned’s outstanding two-day trek to Gokarna. Consumption of alcohol, intoxicants and smoking would not be tolerated during the entire course of the journey. Kindly co-operate with us to make the experience more fun. In the case of traffic delays or breakdowns, expect a few delay in reaching the destination. Plan The Unplanned will not be responsible for any loss/ hamper of your possessions. We request you to be alert about whatever you carry. All the meals will be Veg if included. Special Details: Pick up starts at 5:00 PM.